Jeb Stallworth has always had too much going on in his life to worry about settling down. Sure, one day he’ll want to do the family thing…and luckily he has just the right woman waiting in the wings: Cara Rivers, beautiful widow, three great kids, Jeb’s best buddy. But when Jeb decides that one day is right now, it turns out he might have forgotten to keep Cara on the same page. 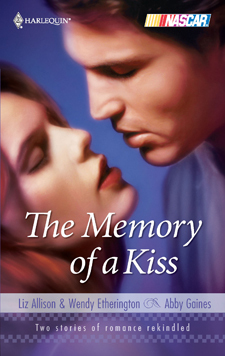 She’s convinced Jeb’s not husband or father material – the memory of a kiss is nowhere near enough for her. Nothing like slamming into a wall at a hundred and eighty miles an hour to sharpen a guy’s focus. From the first, jarring impact, Jeb Stallworth did what he had to, running on instinct. Steered the No. 464 car away from the idiot who’d knocked him into the wall. Braced himself for a pasting from the No. 502 car coming up fast in his rearview mirror. Tried to figure a way to get this machine back into its line so he could grab a win here at Daytona. A win that, ten seconds ago, had appeared his for the taking. He’d never won at Daytona before, and now—damn, there it was. Into the wall again. Jeb lurched in the confined cockpit of his car. Typical Eli Ward, always too light on the No. 502’s brakes. Although Jeb’s brain knew that the SAFER barriers compulsory at NASCAR-sanctioned tracks were far easier on his body than the old-style concrete walls, they weren’t any more pleasant to hit. Dammit, he was airborne. Not much a driver could do once his wheels left the ground, not even a NASCAR champion. Weird how turning upside down seemed to happen so slowly…. The car came down on its front bumper…. Huh, been a while since I did a double roll. How many times had he crashed in the twenty-some years since he’d started racing a midget as a fifteen-year-old with special dispensation? Since then he’d raced bikes, dragsters, dune buggies. Pretty much anything on wheels. Remember the time he crashed that dune buggy in the Sahara? Right on cue, the crash played in his head, like a movie. Distracting him from the fact his car was now going airborne for a third time, and his crew chief was yelling in his headphones, with something less than his usual professional aplomb. Guess this crash looks really bad. Jeb caught a glimpse of fans on their feet, some with hands clamped over eyes or mouth, others with their mouths wide open, as if they were shrieking. Heck, how bad was this crash? Images of other smashes pelted through his mind at full speed. There was that huge one in Dallas that had sucked in both Jeb and his best friend, Pat Rivers. Pat was gone now, killed in a boating accident, ironically enough. Damn, Jeb still missed him. At least Pat had died knowing he’d lived life to the full. Not just on the racetrack, but with his family. Jeb searched the footage playing through his head for some indication that he, too, had extracted the maximum from life. Just in case everything went south right now. He saw more crashes. But plenty of podium finishes, plenty of trophies. He was a champion, and there weren’t many guys who could say that. Ah, there was his personal life now. Look at those gorgeous women he’d dated. There was, uh, Mandy…or was it Millie? Mary? What the heck? For the life of him, he couldn’t remember one single name. Had his helmet been dislodged, allowing a memory-blanking blow to his head? Jeb didn’t want to remove his gloved hands from the wheel to check. He couldn’t steer through midair, but something about gripping the wheel made him feel he had a say in how this thing ended. Why couldn’t he remember the women he’d dated? Why didn’t he feel even a flicker of loss? If a guy’s life was going to flash before his eyes, shouldn’t it be a little more meaningful? Early Monday morning, Jeb lay on the couch in front of the fire in the beamed living room of his home on Lake Norman. It was still dark enough outside that the view of the lake didn’t draw his eye. He hadn’t slept much, and though he had only a sprained right wrist to show for that spectacular crash, he didn’t feel like doing anything more than watching the replay of yesterday’s race. On his widescreen TV with surround sound this time, not in his head. He hadn’t even needed to go to the hospital at Daytona, and the doctor at the track’s infield care center had said with a shrug that Jeb would doubtless be driving in next Sunday’s NASCAR Sprint Cup Series race. So why was he lying here, staring into the flames with all the energy of a poached egg? Not because he was ticked off over being robbed of that elusive victory at Daytona. But because when he’d landed back on all four wheels and stuck an arm out the window to tell the safety crew—and the millions of fans—he was okay, he’d wondered if okay was enough. If he was missing out on something important. “Jeb? You awake? It’s me.” A female voice broke through the rising excitement of the commentators on the TV. Jeb muted the sound. “In here.” Already the sense of futility was lifting; he stood, just as Cara Rivers appeared in the doorway, wearing the pale green scrubs that served as her uniform in her job as a labor and delivery nurse. She carried two cups of takeout coffee, mocha for her, latte for him. “I thought you might still be sleeping off the injuries you sustained setting a new record for in-car acrobatics,” she teased as she crossed the plush gray carpet. Her kiss landed somewhere near his chin. He considered dragging her into his arms and kissing her the way he had once before, long ago. Whoa. The emotional aftermath of the accident was going to his head. And other places. He planted himself back on the leather couch. “Kids okay?” he asked. “The sitter was getting them out of bed when I left. You’d think it’d be easy, since we follow the same routine every morning, but there were the usual grumbles all around.” Cara put the coffees on the table and settled next to him. Even in her scrubs and sneakers, with her blond hair tied back in a short ponytail, she was sexier than any woman he knew. “How’s the wrist?” Her fingers trailed lightly over the bandage. Jeb’s veins thrummed beneath her touch. Platonic was definitely off the menu today. Ryder McGraw, his crew chief, had said it was the most terrifying smash he’d seen in years. Cara chortled, and she sounded like a teenager, not the thirty-four-year-old woman she was. She’d been eighteen when they met, to his nineteen. In terms of maturity, though, of knowing what she wanted, she’d been way ahead of him. “Like you don’t have a rubber skull,” she joked. Jeb stifled a pang of irritation. Sure, Cara was voicing his own laidback thoughts. But he couldn’t help remembering how every time Pat had the tiniest fender bender on the track, she’d be sobbing and covering her eyes. So worried she wouldn’t sleep for two nights afterward. Clinging to Pat as if he was the most precious thing in the world. “I could have been seriously injured,” he said, not liking the whine in his own voice. At least she cared enough to worry about his standing in the series points. “Just because he’s gorgeous and the reigning champion, he gets away with murder,” she continued. She thought Garrett Clark was gorgeous? Jeb stiffened. “I’ll show Clark who’s boss next Sunday,” he promised. He envisaged her in her kitchen, grimacing over a substandard brew. In his mind, her hair was sleep-tousled and she wore very short shortie pajamas, and nothing else, which he knew was unlikely in the depths of a Charlotte winter. Still, it made for an intriguing picture. After he’d got past the shock of losing Pat in that boating accident, Jeb had realized he still wanted Cara…and now she was free. But he’d been in no hurry to do anything about it. They’d both needed time to mourn Pat. And Jeb’s racing kept him so busy, it was less complicated to avail himself of more casual female companionship. But he’d always figured that he and Cara might end up together one day. Spooky that he’d just been wondering what was missing, and Cara should turn up in his living room. Maybe what he was missing was the right woman to share his life. Maybe the right woman was right in front of him. Maybe one day was now. Today. The thought rocked Jeb, first with its life-altering implications, then with its simplicity. Why not go after the meaning that his life lacked, starting now? He and Cara would be great together and he was crazy about the kids. They could move in tomorrow! Mentally, he applied the brakes. Cara was naturally cautious. She’d become his best friend in her own right, so making a move on her would be a major rocking of the boat. A risk. If you don’t take a risk, you don’t win. Still, no point jumping the green flag. First up, Jeb needed to know where she was at in her love-life. He picked up his coffee and took a considered sip through the hole in the lid. “How was your date on Saturday night?” He’d encouraged Cara to get back into the swing of dating recently—it would be painfully ironic if she’d fallen hard for some other guy. “So…do you like him?” Jeb wasn’t used to dancing around a subject. His instinct when he saw a gap was to drive straight through. “I do.” Cara smoothed her scrubs over her thighs. “He asked me to dinner on Wednesday, so I guess he likes me, too.” A little smile played on her lips. Was she serious about this Mike character? Dammit, Jeb’s career, his life, depended on his making the right move at the right time out on the track. He should have known better than to leave his personal life to chance. Way to sound like a spoiled brat. But it was true. He’d met Cara at the Nashville track when he was a rookie in the Camping World Truck series. Which meant he’d known her longer than she’d known Pat. She’d found him attractive, regardless. Jeb hadn’t hesitated to ask her on a date. He’d taken her to a French restaurant in downtown Nashville, about ten rungs higher than where he usually took a first date. Because from the get-go it had been clear Cara was different. That she knew what she wanted and wouldn’t accept less. Beneath his up-and-coming-NASCAR-star cool, he’d been daunted. That was all he intended to say, because Cara valued good manners. A gentleman wouldn’t remind her how they’d slipped into a darkened doorway and, to the accompaniment of country music wafting from the bar next door, shared that incredible kiss. At least, a gentleman wouldn’t remind her outright. “Um, sure.” Her cheeks were pink. Oh, yeah, she remembered. This was all going exactly the way it should. “You must have kissed a million women since then,” she said. “But you’ve lost count, right?” she said blithely. “Uh…” Okay, this wasn’t his finest moment. He had indeed lost count of the number of women he’d kissed. But it was never too late for a guy to cut back. “Whereas I can number the men I’ve kissed since then on one hand,” she continued. Did that mean she’d been kissing other guys, those guys she was dating? Of course she has. She was a grown woman with…needs. His mind shied away from her meeting those needs with some accountant. His hands clenched on his knees. Shouldn’t Cara be a little jealous that he’d kissed so many women? “No way. You and Pat were together twelve years, and it’s taken time for you to be ready to—” get back on the horse “—resume a single life. Now that you are, you’ll have dozens of guys lining up.” He might need to put some work into getting to the front of the line, but didn’t he do that for a living? With considerable success? Cara eyed him curiously over the rim of her cup. Faint morning sun had begun to lighten the room, giving Jeb the sense of a new beginning. Cara’s face shuttered. He shouldn’t have alluded to Pat. “What’s your point?” she asked tightly.